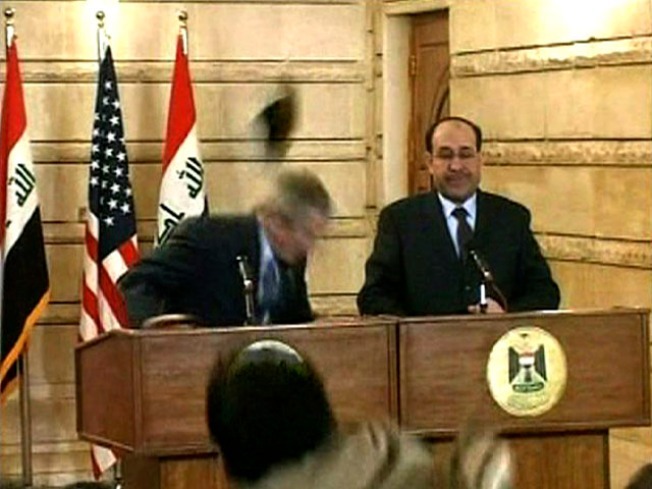 With cat-like reflexes, President Bush ducked not one but two flying shoes last week in Iraq. With two quick flicks of a wrist, a Turkish-made shoe has become an international hit. Ramazan Baydan designed the "Ducati Model 271" some 10 years ago. So when Iraqi journalist Muntadar al-Zeidi leapt to his feet last week and sent a pair of size-10s whizzing past President George Bush's ear, Baydan recognized them instantly. "I couldn't have missed it, no way," Baydan told the New York Times. "As a shoemaker, you understand." Since the unpleasantness, Baydan has received orders for more than 300,000 pairs of the infamous shoe. He normally sells only 75,000 a year. It goes without saying that Baydan plans to add more staff. And of course, the shoe will likely be rechristened "The Bush Shoe" or "Bye-Bye Bush." Now there are posters being mailed from Baydan Ayakkabicilik San. & Tic. in Istanbul out across Turkey and the Arab world that read "Goodbye Bush, Welcome Democracy," in Turkish, English and Arabic. "Mr. Bush served some good purpose to the economy before he left," noted Baydan's general manager, Serkan Turk.